Weather: 9°C. Fair, still quite windy but not as cutting. Sunny even for most of the day. Another practical symposia was running this week at Dixter and the main focus was winter work like pruning. One of the initial plants that we worked on were hydrangeas. One of the first steps we did was to remove stems that had flowered and leave only the flowering stems. Mop head hydrangeas (macrophylla types) flower on old wood. The ones that are to flower this year has a very distinctive bud at the end of the tip. If we did not have enough flowering material then we could decide to leave a few good stems cut strong leaf buds if necessary, so that they might develop into flowering stems in the future. Some stems that were stunted in mid-flowering were left in case they might do so fully a bit later too. 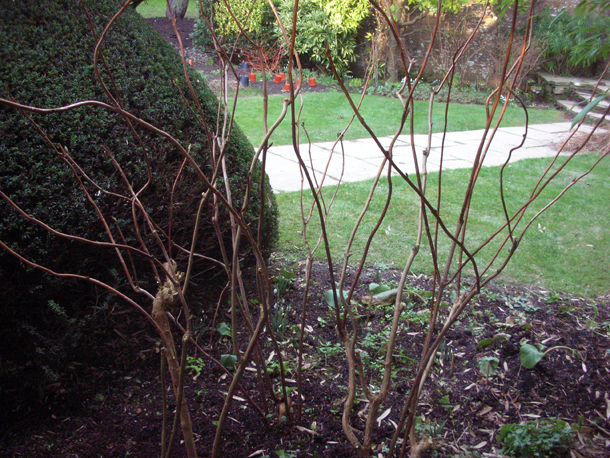 The general idea was to cut out as much of the paler old grey wood out as possible and to leave the darker more vigorous brown stems. Once we cut off the flower heads we took a step back to see if it required thinning, if there were stems crossing over, if we needed to open up the plant more and that maximise the amount of light hitting all the stems, if we need to prioritised which flowering stem we wanted to concentrate the energy on, as well as considering the overall shape and size of the bush. We would also decide if we wanted to take out any of the bigger older key stems in case we wanted to rejuvenate it for new growth to come from the base. We didn't approach it with a blanket formula though and would treat them on a individual basis depending on the factors that governed them. I pruned Hydrangea macrophylla 'Madame Emile Mouillère', a white mophead & a pink Hydrangea macrophylla 'Hamburg' in the Walled Garden.